Consumer prices in the US will quadruple by 2010. 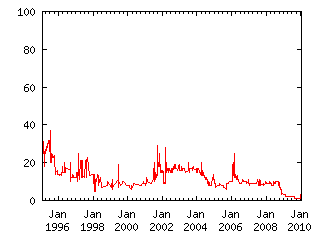 The measurement period is from 1/1/1995 to 1/1/2010. The judge may use the government's consumer price index, or substitute a more reliable measure. * The Consumer Price Index (CPI) has been attacked for years as overrepresenting the rate of inflation. (Two reasons regularly recited for this are that the CPI fails to account for price substitution and that the CPI does not reflect improved quality of goods.) Had the Federal Reserve Board substituted another index for the CPI as its lead benchmark for consumer inflation, I would have used that benchmark in judging the claim. The seasonally-adjusted CPI was used. I will judge based on the intent of this claim, if I perceive such intent to be obvious. If such intent is ambiguous I will judge on the basis of the precise wording. If both are ambiguous, I will look for a solution which follows IF/FX precedent insofar as such precedent is apparent to me and applicable to the claim. I will seek the guidance of the claim's owner/author in interpreting the claim. It's his or her question - s/he ought to get the answer sought. If I believe this claim to have met a YES or NO condition, and if I believe judgment will be controversial, I will post a prospective judgment to fx-discuss and forestall entering the judgment for a comment period to be announced in the post.